The pack have obviously lost another member as they are now down to eight. We could not have been better positioned to watch the mayhem unfold; driving at the time, I was obviously not able to capture it all on film but the moment was unreal. The alpha male spotted a herd of Nyala and with a flick of the tail summoned the pack members to back him up. In a flash the chase was on. Galloping at full speed we could see the dogs literally flying behind a number of antelope. It was electric. No alarm calls were heard; there simply was not time for that. With a gentle touch they nudged a young female Nyala; being off balance and at full sprint, she toppled and rolled. The Wild Dogs were on her in a second as dust flew. Just to the left, another dog had also managed to trip a sub-adult male Nyala sending him crashing to the ground. He put up more of a fight but five members of the pack silenced him. We nearly saw a third kill as the mother Nyala narrowly managed to hurdle the alpha female. Once the kills were made they fed at breakneck speed. Dashing backwards and forwards between the two kills. In ten minutes there would be nothing left of either kills. Close up of the swollen teats and proof that the alpha female is expecting. It is usually around May that she will give birth in the protection of an old termite mound. We all wait with excitement to see where the pack decide to den their next precious litter of pups. 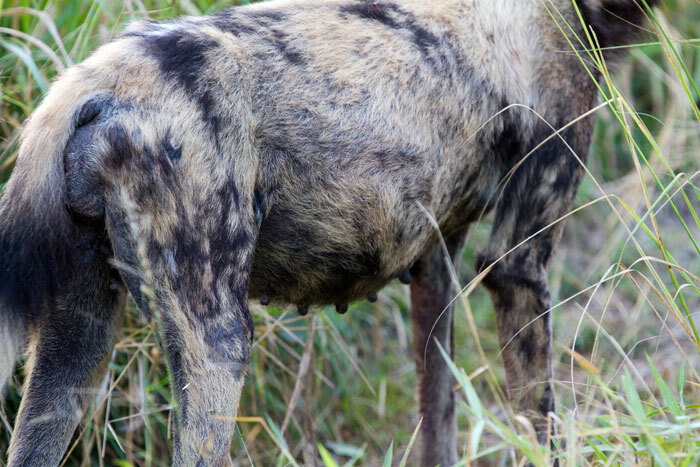 With a very small population of Wild Dogs in the area, every individual is crucial. 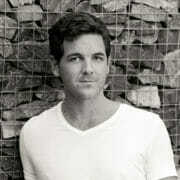 Thanks Adam! Fantastic coverage of my favorite animal of the bush. 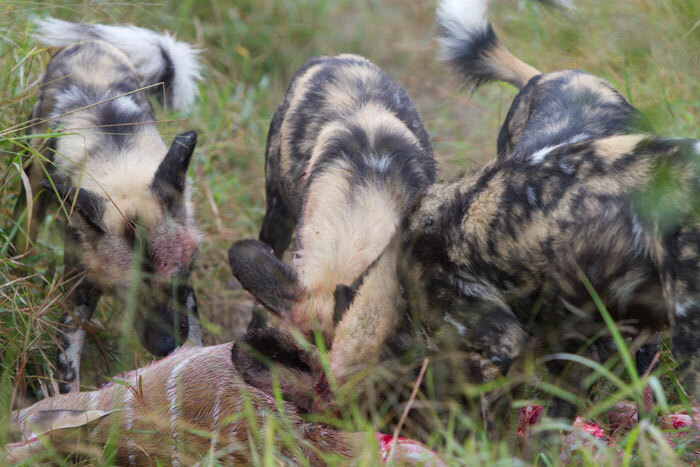 Great video of wild dogs feeding. Wow, they eat fast! has the alpha female had her pups yet, or picked a denning spot? 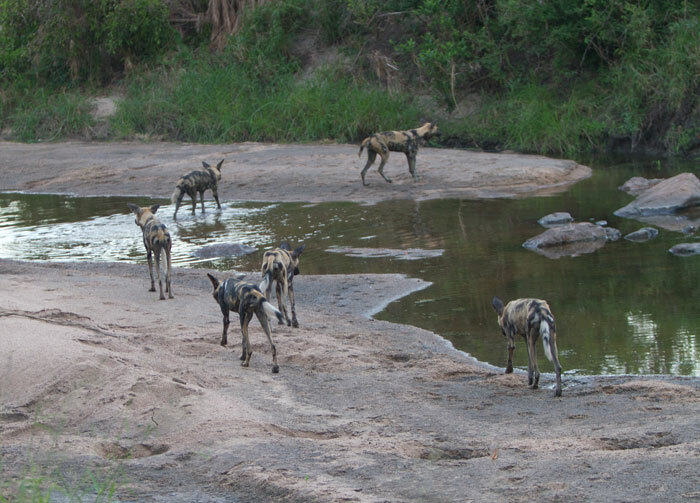 We’re arriving at Londolozi in a bit under 5 weeks and really hoping we see the dogs – and if there are pups, even better! ok, thanks Rich! 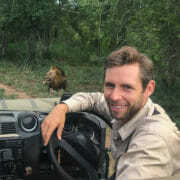 I am really looking forward to it with great excitement – our first visit to Londolozi and to Africa! Our trip is now very close – we will be at Londolozi in about 10 days! Has there been any more word of the wild dogs and the pups?